This image from the Hubble Space Telescope shows an irregular galaxy known as NGC 2337. The blue patches in this image indicate the presence of newly formed, young, hot stars. 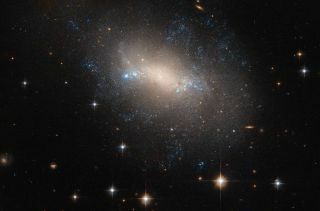 An irregular galaxy with a peculiar, lopsided shape was photographed by NASA's Hubble Space Telescope. The galaxy — known as NGC 2337 — is located 25 million light-years from Earth in the constellation of Lynx. NGC 2337 is an irregular galaxy, which means that it lacks a defined shape. The new Hubble image captures the sparkling stars of the galaxy, including blue patches that indicate the presence of newly formed, young, hot stars, NASA officials said in a statement. Irregular galaxies like NGC 2337 get their random shape from close encounters with other galaxies. When two galaxies collide, they can be stretched or warped by the interaction of gravitational forces. "Despite the disruption, gravitational interactions between galaxies can kick-start star formation activity within the affected galaxies, which may explain the pockets of blue light scattered throughout NGC 2337," NASA officials said in the statement. Galaxies normally contain millions to billions of stars, which can be organized into spiral arms — like the Milky Way — in an elliptical shape, or in a random, undefined shape like NGC 2337. Roughly a quarter of all known galaxies in the universe have been found boasting an irregular shape, and studying these stellar configurations can help astronomers learn more about how galaxies interact, evolve and give birth to new stars.